Let’s be honest; Ads are an interruption. In fact, they always have been. Advertising officials have attempted their best to shroud that fact by making advertisements interesting, amusing, and periodically even downright controversial. But people are gradually becoming smart. With display ads revenues contracting, marketers are constantly looking for alternatives. Well, native advertising could just be it. The essential rationality of native advertising rotates around making ads seem less like ads. Envision you’re skimming through a news website when you come to a story that catches your eye. It highlights a particular item – suppose, a designer shoe – and the article says that a celebrity wore that match of shoes to the Grammy. You find yourself intrigued, and the photos of the shoe is great. You’re satisfied with the article and reminded that it’s been a while since you got yourself a pair of designer shoes. There you have it – You have just effectively engaged with native advertising. Therefore, what precisely is native advertising? Native ads coordinate the form and capacity of the platform on which they are hosted. Native ads are part of the content (or, as some would say, are disguised as the content). • Effective in attracting customers. Since native ads differ from traditional ads, they perform better in connecting with the targets. • Native ads can be shared across various platforms since they take the form of valuable and decisive content. • They construct relationships through encouraging communications between a brand and its target consumers. Businesses who associate their native ads with the media outlets and its targets have enhanced options of having their content shared. 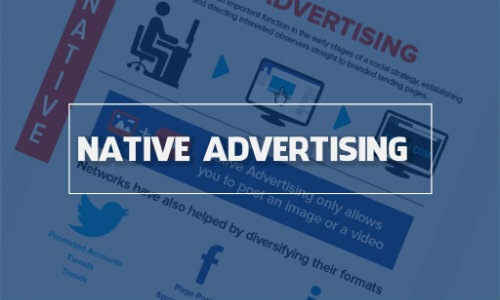 What are some Native Advertising Best Practices? • Go for a 0.50% or higher CTR. Your CTR dictates the click prices. The greater your CTR, the lower your CPC. • Remember that unlike Facebook, the image in your native ads matters. Just make certain it’s significant with bold colours. • Instead of pausing your ads lessen your maximum CPC or everyday budget. Pausing hauls your ad out of the SEO algorithms. • Create a new campaign for every interest you target, else you won’t know which interest is performing well. • Continuously test different ads in every campaign. What are some Platforms for Native Advertising? These days, there are a handful of native ad networks available that can help brands contact a more extensive crowd by distributing content in places where people consume information on the internet. Some great platforms to create a campaign include; Revcontent, Outbrain, Taboola, Gravity, Nativo, and TripleLift. As depicted above, native ads mean they are native to the platform. When you use Facebook ads or Twitter ads for native advertising, you ought to make them look and feel just like regular posts on the platform.